Feel Free Nutrition Protein Porridge Vegan is a meal replacement based on gluten-free oatmeal and plant-derived protein. Oatmeal is very easy to prepare, to be eaten cold or hot. Its composition was composed so that both vegetarians and vegans could reach for it. People more and more often choose a vegan diet, which, if properly composed, not only helps to maintain a slim figure but also has a positive effect on health. Nevertheless, this nutritional model is associated with numerous restrictions and limitations. It assumes exclusion from the menu of all animal products, i.e. both meat and eggs, and dairy products. For this reason, vegans have a fairly limited choice when it comes to ready-made food products. In order to meet the expectations of customers, Feel Free Nutrition has designed a vegan version of its iconic product, the protein porridge. It contains exclusively plant-derived ingredients. It is based on gluten-free oat flakes and proteins extracted from soy and peas, and it additionally contains green vegetables and algae. Providing the body with an adequate supply of protein on a vegan diet is quite a challenge. A portion of Feel Free Protein Porridge contains up to 22g of this valuable macronutrient. Importantly, the manufacturer combined soy protein with pea protein. Specialists emphasize that vegetarians and vegans should reach for a variety of plant products because this is the only way to provide the body with access to all essential amino acids. Soy protein is one of the most popular plant proteins. It has an excellent amino acid profile and contains an extremely high amount of arginine. In turn, the protein extracted from peas is extremely rich in leucine – an amino acid with powerful anabolic potential. Oatmeal is systematically gaining popularity and is more and more willingly included in the diet of people wanting to maintain health and slim figure. Some people still associate it with the tasteless mash that was served at breakfast in childhood. If you struggle with similar associations, you should try this product, at least for that alone, to see how delicious porridge can be. The proposed porridge tastes like a sweet, fudgy chocolate cake. This is why it can successfully replace your favorite dessert. It contains real cocoa, natural aromas and safe sweeteners, such as stevia or sucralose. They perfectly mask the aftertaste of algae, as well as the aftertaste of green vegetables, spirulina or chlorella. They are an important component of the product because they provide many vitamins, minerals, and compounds with numerous health-promoting properties. The ease of preparation is a big advantage of the presented product. You do not have to pour its contents into another cup. Just pour a small amount of water into the container and mix thoroughly. Already after a while, you can enjoy a complete, properly-balanced and delicious meal that tastes equally good both cold and hot. The cup with porridge is small and you can easily take it to work, school or even the gym. Due to the high content of protein and complex carbohydrates, this porridge is ideally suited as a peri-workout meal. In conclusion, Feel Free Nutrition Protein Porridge Vegan is a product designed mainly for vegans. It does not contain any ingredients of animal origin, it is rich in vegetable protein. People with gluten intolerance can also reach for it. Add 100-150 ml of cold water. Reseal lid and shake. Protein Porridge is ready. To heat, place in microwave for 20 secs after adding cold water. The producer suggests pouring the contents of the cup with water, however, a plant drink (rice, almond) will work just as well. Porridge can be eaten instead of a meal or in the form of a dessert. It perfectly goes with seasonal fruit, nuts, and almond flakes. Nevertheless, note that they will increase the caloric content of the meal and are not recommended for people on a reducing diet. Feel Free Nutrition is a company that debuted on the market in 2011. Its founder is Adam Read – a well-known coach and dietitian. The company's flagship product is protein porridge, available in many delicious flavors, enriched with substances commonly used in sports and pro-health supplementation, such as creatine, omega-3 acids, caffeine, beta-alanine, etc. Feel Free Nutrition targets its offer primarily to people who prefer a healthy, active lifestyle. All products are extremely nutritious, based on natural food, with minimal content of sugar, free of unnecessary fillers or artificial additives. At the same time, they taste great and are very easy to prepare. 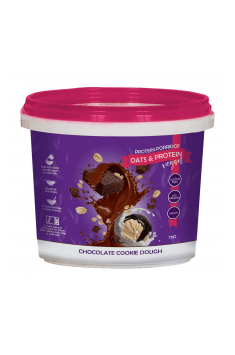 Gluten-free Oatmeal, Protein Blend (Pea Protein Isolate, Soya Protein Isolate), Maltodextrin, Artichoke Leaf, Chlorella, Spirulina, Kale, Ginger Root, Green Tea Extract, Alfalfa, Broccoli, Spinach, Wheat Grass, Grapeskin, Cocoa, Chocolate Cookie Dough Flavourings, Sweeteners (Stevia, Sucralose). Powdered bark of Catuaba. Strengthens sexual functions in women and men, improves work of the nervous system. Maca stimulates the sexual experience of both men and women.